We have defined the Milky Way as the conglomeration of objects that are mutually bound to each other by the force of gravity. The Milky Way thus consists of stars, gas, and dust. The gas in the Milky Way takes many forms, but the most visible forms are the different types of bright nebulae. Many different nebulae were well known to astronomers in the early part of the 20th century, but their nature was not yet entirely understood. Recall that the Messier Catalogue from the 18th century included a number of nebulae, and the NGC catalogue of the 19th century included thousands more. By the early part of the 20th century, one specific type of object in these catalogues, called “spiral nebulae,” was generating a lot of debate because the nature of these nebulae was not understood. Below is an example image of M51 (unfortunately, it is not very well reproduced in this image), published in 1910 by George Ritchey. Note that the label he uses is "Spiral Nebula Messier 51." The data used by both Shapley and Curtis in their debate were not of high enough quality to conclusively solve the debate over the nature of the spiral nebulae. However, even though they drew other conclusions that have since been proven incorrect, both astronomers made points that fundamentally altered the understanding of our place in the Universe. Shapley did show that the Milky Way is larger than it was believed at the time and that the Sun is offset from the center. His incorrect conclusion was that he believed that the Milky Way was so large that it could encompass the spiral nebulae. Curtis' main contribution was to argue that the data available were not of sufficient quality to conclude that the spiral nebulae were inside of the Milky Way, and he believed that we would eventually find them to be external objects similar to the Milky Way. His argument relied on his belief that the Milky Way was much smaller than it truly is, however. So, although Curtis was proven correct about the nature of the spiral nebulae, he came to that conclusion based on a faulty assumption! One observation was made shortly after the Great Debate that conclusively settled the debate on the nature of the spiral nebulae. Using the 100-inch telescope on Mount Wilson, Edwin Hubble took images of M31, the Andromeda Nebula. He discovered that M31 was composed of stars, and he even identified several Cepheid variable stars useful for measuring the distance to M31. If you remember our discussion of Cepheid stars, they have a very specific relationship between their variability period and their luminosity. Thus, if you measure the period of a Cepheid variable, you can estimate its luminosity. Then, if you measure the apparent brightness of the Cepheid (which you can do using the same observations you took to get its period), you can measure its distance. When Hubble calculated the distance to Andromeda, he found that it was much larger than the size of the Milky Way, confirming that this was another galaxy like the Milky Way, and not a “spiral nebula” inside of the Milky Way. The American Institute of Physics has an excellent website called "Cosmic Journey: A History of Scientific Cosmology. " There is a page on "Island Universes ," which goes into many of the same topics discussed here. Near the bottom of that page are quotes from Hubble, images of his notebook , and a better reproduction of his famous M31 image  than available at APOD. 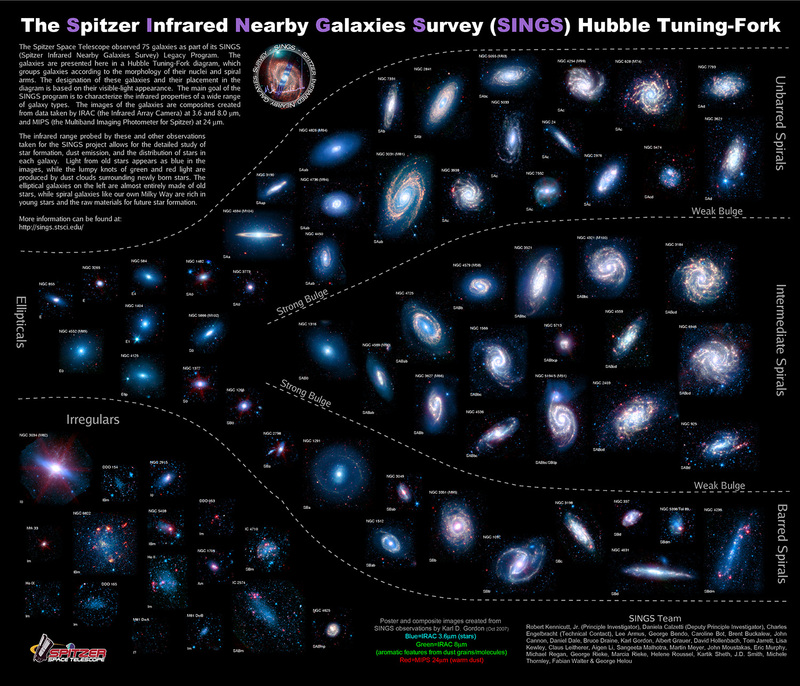 The Hubble Tuning Fork has been reproduced many times with many different sets of galaxy images. A particularly detailed version was produced by the Spitzer Infrared Nearby Galaxies Survey  (SINGS) group. The group wrote a brief article describing their work  for you to read. If you want to print this out as a full-size poster for your classroom, they have made available a 4200x3600 TIFF file  that provides enough resolution to do so. You can find many, many more images of galaxies at a variety of websites, but here is one source at the National Optical Astronomy Observatory  with an excellent sample of many of the well-known types. In some spiral galaxies, the bulge has a well-defined BAR that passes through the bulge. Hubble classified these galaxies by referring to them as SB galaxies with subclasses a, b, and c, just like the normal spirals. The spiral arms in barred spirals appear to originate at the ends of the bar, instead of in the bulge, like they do in normal spirals. We believe that the Milky Way is a barred spiral, perhaps an SBb or SBc type. The schematic image of the Milky Way  that you studied in a previous lesson shows the Milky Way bar. Besides the presence of the bar, the properties of barred spiral galaxies are very similar to normal spirals. There are many other properties of galaxies we can discuss in some detail, but to conclude our discussion of normal galaxies, we should briefly discuss the size of typical galaxies. Among spirals and barred spirals, there is a reasonable amount of uniformity. Some spiral galaxies, like M33 , are measurably smaller than others, like M31 , which is approximately four times larger. However, in general, the differences are small. Within the class of elliptical galaxies, however, there is a much larger range of sizes. Some galaxies are referred to as dwarf ellipticals because they share many of the properties of elliptical galaxies but are significantly smaller and less massive. NGC 205 is an example . If we take a census of the galaxies in the Universe, it appears that by number, dwarf ellipticals are the most common type of galaxy in the Universe. One technique for studying galaxies that astronomers have been using with modern, space-based observatories is to take deep fields. The longer you leave the shutter of your camera open while pointing at a particular part of the sky, the fainter the objects you will be able to see. In astronomical jargon, the fainter the faintest object in your image is, the "deeper" the image. In 1996, Hubble released the "Hubble Deep Field," which was a revolutionary image in its day. It is reproduced below. If you look closely, the few objects with spikes on them (a white one near the lower left and a yellow one on the center-left) are stars in the Milky Way Galaxy, but every other object in this image is a distant galaxy. Thus, by taking a deep field, astronomers are presented with an excellent representative sample of the types of galaxies in the universe. We will return to the Hubble Deep Field for Lab 3. For the most part, all of the galaxies that we observe locally, and that we find in deep fields, are normal galaxies. They contain billions of stars, clouds of gas, and dust. When we take a spectrum of the integrated light from the entire galaxy, it looks like the sum of the light from a large group of stars. Remember, stars have spectra that are very similar to blackbodies, but with absorption lines. So, for the most part, a galaxy's spectrum looks like a blackbody spectrum, but also with a lot of absorption lines. See for yourself the spectra of galaxies. The Sloan Digital Sky Survey has measured the spectra for many galaxies. In the window of data on each SDSS object, click on the thumbnail image of the spectrum in the lower left to bring up a full sized image of the spectrum. Bring up the SDSS Object Explorer for Object ID 587722982271090881 . Bring up the SDSS Object Explorer for Object ID 588015507682230507 . Bring up the SDSS Object Explorer for Object ID 587731513690095801 . How do these spectra appear? How are they similar to each other? The total luminosity of the galaxy is much larger (perhaps 1,000 times larger) than a normal galaxy. The spectrum of the galaxy is very different from a typical galaxy; it gives off more light at all wavelengths than a normal galaxy does, and there are many bright emission lines in its spectrum. The extra luminosity from these “Seyfert Galaxies” comes almost entirely from the nuclear region of the galaxy, not from all areas of the galaxy equally. In general, any galaxy that shows evidence for a source of radiation that is not being created by stars is called an active galaxy. Because the non-stellar light from these galaxies is concentrated in the nucleus, they are usually called Active Galactic Nuclei or just AGN. Below is a sample image of a Seyfert galaxy, and it is a particularly nice example where it is quite obvious how much brighter the bulge region is compared to some of the other spiral galaxies you have seen previously. These appear superficially to be normal spiral galaxies. One clue to how they differ from normal galaxies is that the "extra" luminosity from Seyferts appears to come from an extremely bright core. In some cases, the core of a Seyfert galaxy is brighter than the entire Milky Way. Seyfert galaxies are particularly bright in the infrared, and this is likely due to dust surrounding the core. The light from the core of a Seyfert can vary on a very short timescale, which suggests that the energy emitting region is less than 1 light-year across. Radio galaxies are often found to be associated with elliptical galaxies, but not always normal elliptical galaxies. Instead, radio galaxies tend to be associated with "disturbed" ellipticals like Centaurus A . Much of the nonstellar radiation from these objects is in the radio part of the spectrum. Also, the morphology of the radio emission isn't always just a point source, instead, we often see a core, jet, lobe structure. In other wavelengths (X-ray, for example), the core of the radio galaxy stands out as a bright point source. The total energy output of these objects is roughly 1,000 times larger than the Milky Way, making them some of the brightest single objects in the universe. In the optical part of the spectrum, Quasars look like bright, blue stars. The name Quasar stands for "Quasi-stellar radio source," because they look like stars, but are in many ways unlike stars. They are bright in the optical, x-ray, and radio portions of the spectrum, and the brightest of these objects is 100,000 times brighter than the Milky Way. See for yourself the spectra of active galaxies (AGN). The Sloan Digital Sky Survey had as one of its major science goals the discovery and study of a large number of quasars. Identical to the data on the normal galaxies, in the window of data on each SDSS object, click on the thumbnail image of the spectrum in the lower left to bring up a full sized image of the spectrum. How do these spectra appear? How are they similar to each other? How do they differ from the galaxy spectra you studied above? If you want to explore more objects beyond the few listed here, you can bring up all of the SDSS objects from a single observation with the Plate Explorer . A question that astronomers asked, and a question you should be asking yourself now, is: What is the source of the difference between normal galaxies and active galaxies? To answer this question, we need to return briefly to the topic of black holes. When a massive star creates a black hole, the mass of the black hole is a fraction of the mass of the star's core. We think that stellar black holes have masses of about 3 times the mass of the Sun. In the core of the Milky Way, we have found that the central black hole is several million solar masses. We think that supermassive black holes (SMBHs) like Sgr A* in the Milky Way are common in the cores of galaxies, and we are able to theorize what happens when a star or other object gets too close to the SMBH. When matter gets close to a SMBH, it will swirl around the SMBH, and we expect this to create a disk of material around the SMBH. This is exactly analogous to the accretion disks we considered when we studied binary star systems. We believe that in many ways they look similar. As shown below, the material in this disk falls into, or accretes onto, the SMBH. As the material swirls closer and closer to the SMBH, it speeds up. Friction among the particles in the disk causes the gas to heat up, and it can reach temperatures of millions of kelvin. These disks full of hot, fast moving gas emit radiation, and the amount is large enough to power quasars and other AGN. The jets that we see in radio galaxies and quasars are likely to come from the disk, too, but these are not well understood at all. It is thought that the disk helps to “focus” the jets (see the image above for an example), but the exact mechanism of the creation of the jet and how it stays so narrow over such large distances (a few hundred thousand parsecs) is a topic of ongoing research. The Milky Way has an SMBH in its core, but the Milky Way is not an AGN. So, clearly, just the presence of an SMBH alone cannot be the only requirement for the creation of an AGN. The answer to this again rests with the accretion disk. The accretion disk fuels the central power source in AGN, and if there is no fuel or not enough fuel, then the galaxy will not be seen as an AGN. When we look at AGN in detail, it appears that many of them appear to show evidence for the host galaxy absorbing another galaxy. This act of galaxies merging with each other can funnel gas into the core, providing ample fuel to power the SMBH. This idea does imply that AGN will "shut off" over time as they run out of fuel. In 2016, Penn State astronomer Jessie Runnoe and her collaborators discovered a quasar  that appears to have run out of fuel in between observations! When we studied stars, we discovered that they were found in specific groupings that you might see as analogous to how people populate communities on Earth. For example, we see star clusters, which are in some ways like "cities" filled with about half a million stars. We also find stars in groupings of billions of stars inside of galaxies, so you might consider galaxies to be similar to "countries" of stars, although no country on Earth has 100 billion people! Now that we are studying galaxies, we can use observations of the environment around the Milky Way to inform us of the types of communities in which galaxies are found. If we survey the local universe around the Milky Way, we find that there are a few dozen galaxies in our neighborhood. More specifically, we define our “group” to include those galaxies that we believe to be mutually bound to each other by the force of gravity. Collectively, we refer to this group of galaxies that includes the Milky Way as the Local Group of galaxies. The Local Group contains only a few large galaxies, all of which are spiral galaxies. These are the Milky Way, Andromeda (M31) and M33, which is also called the Triangulum Galaxy. Most of the rest of the Local Group members are different types of dwarf galaxies. There are irregular galaxies, like the Large Magellanic Cloud (LMC) and Small Magellanic Cloud (SMC), there are dwarf elliptical galaxies like M32, which is a satellite of Andromeda, and there are dwarf spheroidal galaxies like Sculptor, Fornax, and Ursa Minor (named after the constellations in which they are found). For the most part, though, these objects are all much smaller and less massive than the Milky Way and Andromeda. If we compare the galaxies by their luminosities, for example, the Large Magellanic Cloud is about 1/10th as bright as the Milky Way, which suggests that it has about 10% of the mass of the Milky Way. Some of the smallest dwarf spheroidal galaxies in the Local Group are as faint as 1/50,000th the brightness of the Milky Way. Therefore, even though the dwarf galaxies are dominant in number in the Local Group, the three spirals dominate the mass of the Local Group. This is common in most environments. There are a range of galaxy sizes and masses, and there are fewer of the most massive galaxies and many more of the dwarf galaxies. The galaxies of the Local Group are distributed within a volume of about 1 Megaparsec (Mpc) in radius. The volume of a sphere with a radius of 1 Mpc is about 4 cubic Mpc. This means that there are about 10 galaxies per cubic Mpc in the Local Group. If you move outward from the Local Group, you encounter several other groups that are superficially similar to our own. M81 and M82 are two of the largest members of their group about 4 Mpc away from us, which also includes a total of about two dozen known galaxies. Centaurus A is a member of the M83 group, which is about 5 Mpc away. The Local Group, the M81 group, and the M83 group are examples of what are generally called “loose groups,” which are just what they sound like: bound groups of galaxies that are not very densely packed together. You have already seen images of the Milky Way Galaxy from the Digital Universe Atlas, where the disk of the Milky Way was represented as a flat image, and the dark matter halo of the Milky Way was represented with a wire frame sphere. Below is a short movie, captured from the Digital Universe Atlas, showing the point of view of an observer flying around the Milky Way. The green dots that you see represent the 3D positions of the galaxies in the Local Group. In this view, you see primarily the satellites of the Milky Way (e.g., Fornax, Leo I, Leo II, Sculptor) because Andromeda, M33, and their satellites are more distant (in fact, they are the dense group of green dots you see at the edge of the field of view of the movie). An Observer flying around the Milky Way. Green dots in the movie represent the 3D positions of galaxies in the Local Group. For much of this unit, we are studying objects that we simply are unable to see by casually observing the night sky with the unaided eye. However, there is one prominent exception. If you happen to live in or visit the southern hemisphere, you can see two Local Group galaxies without a telescope. The Large and Small Magellanic Clouds are visible as faint, fuzzy patches of sky distinctly separate from the plane of the Milky Way. If you use Starry Night to change your location to Sydney, Australia, you should be able to find the Clouds in the night sky. About 17 Mpc away from the Milky Way Galaxy is a much larger group of galaxies. This group is found inside of the constellation Virgo, and it is usually called the Virgo Cluster. The Virgo Cluster is not much larger than the Local Group (about 3 Mpc in radius), but it contains approximately 2,500 galaxies. If you calculate the volume of a sphere 3 Mpc in radius, you will find that there are only about 25 galaxies per cubic Mpc in Virgo. However, like the stars in a globular cluster, the galaxies inside the Virgo Cluster are very densely packed in the inner region of the cluster, and the density drops off as you get farther from the center. So, the conditions in the core of the Virgo Cluster are very different from those in the Local Group. Actually, clusters show a range of central concentrations, and Virgo is a pretty bad example to use here, since it is one of the least concentrated of galaxy clusters. The galaxy M87 is the dominant member of the Virgo Cluster. It is a large, massive elliptical galaxy and it also harbors an AGN that is creating a powerful jet and lobes of radio emission. If you take a look at the wide-field image of the Virgo Cluster above, you will notice that M87 is very easy to pick out by eye. It is very obviously the largest galaxy in the image. Many clusters contain a dominant, giant elliptical galaxy, and these are called “cD” galaxies. In general, the types of galaxies found in clusters are different from the types found in groups. Clusters tend to contain a higher percentage of ellipticals, while the lowest density environments tend to contain more spirals. Clusters like Virgo are enormous objects. If you consider that these gravitationally bound groups contain usually about 1,000 or more galaxies, that means their mass is about 1015 solar masses! They are considered to be the largest gravitationally bound objects in the universe. By studying the velocities of galaxies inside of clusters like Virgo, we also find that galaxy clusters must contain dark matter (over and above what is in the galaxies themselves). X-ray observations of galaxy clusters show that they contain a large amount of very hot (millions of kelvin) gas, but even adding the mass of this gas to the mass in the visible galaxies cannot account for all of the mass needed to keep these clusters gravitationally bound. In the neighborhood around the Milky Way, the local Universe contains a few small groups of galaxies and a cluster. As we continue to survey out from the Milky Way, we find that these types of structures are common throughout the Universe. Single galaxies are not found in complete isolation, without any companions in their neighborhood. The phenomenon of lookback time is crucial to the study of galaxy formation and evolution. We can directly observe how galaxies appeared when they were forming if we can find galaxies at very large lookback times. In recent years, astronomers have been using the technique of observing deep fields (like the Hubble Deep Field you've seen previously, and more recently, the Hubble Ultra Deep Field ) to pursue the most distant galaxies in the universe. The question that these deep fields have helped answer is: “How did galaxies look billions of years ago?” The answer appears to be that when galaxies were young, they looked very irregular. Galaxies with spiral arms like the Milky Way did not appear until about 10 billion years ago. We think that galaxies apparently formed from the bottom up; that is, more than 10 billion years ago, small, irregularly shaped sub-galaxies appear to have collided and merged, leading to the formation of the large spiral and barred spiral galaxies that we see today. 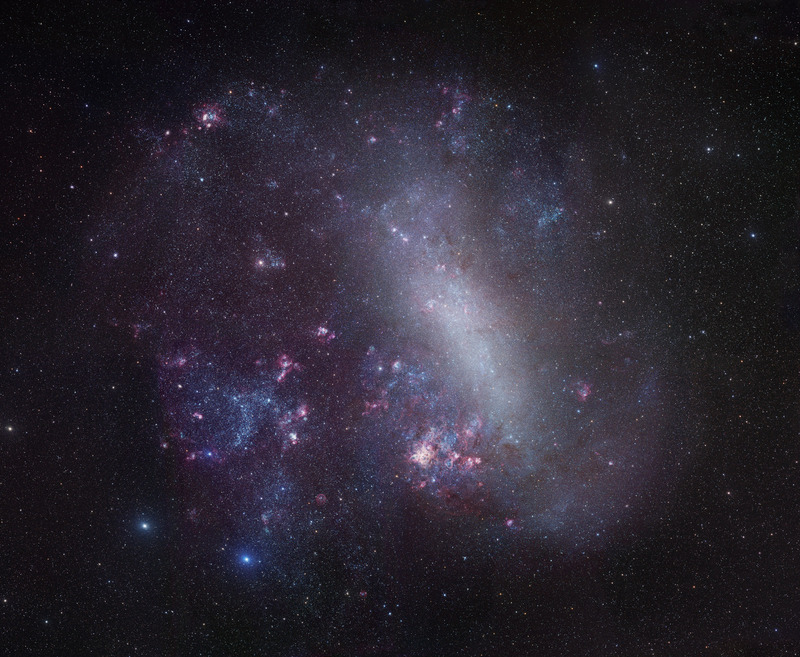 Although the Milky Way continues to form new stars today, the star formation rates in these subgalaxies were much higher. Observations suggest that the peak of star formation occurred about 8 billion years ago. Below is an image of several very distant, and therefore very young, galaxies observed in the Hubble Ultra Deep Field. Compare these to the images of nearby galaxies that you have seen previously. Hubblesite has an online exploration called "Galaxies Galore ." The Fermi Gamma-ray Space Telescope has produced an "Active Galaxy Education Unit ." The Galaxy Evolution Explorer (that is, GALEX) has a few activities for teachers . 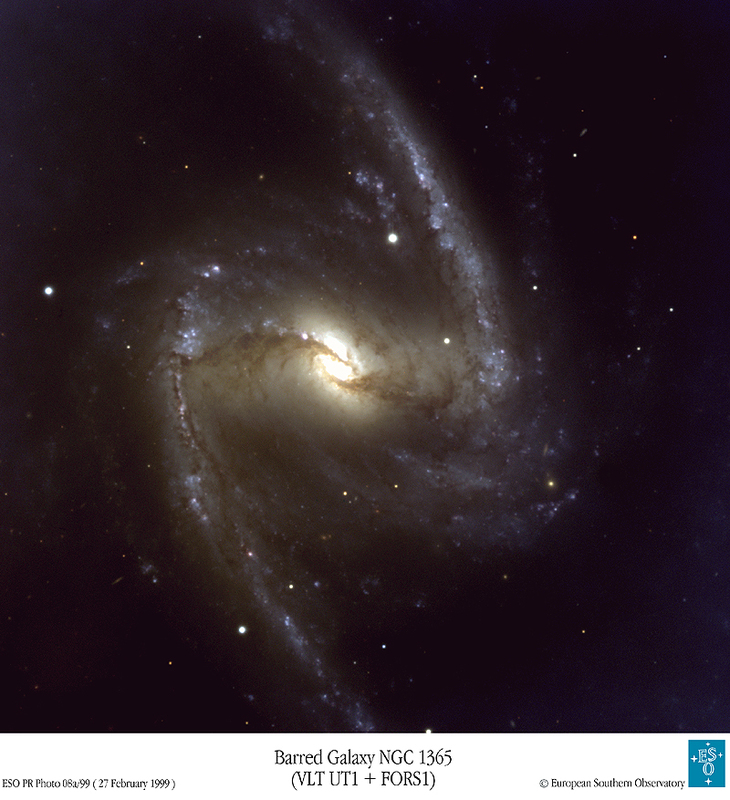 You and your students can contribute to a project to classify galaxies from the Sloan Digital Sky Survey with Galaxy Zoo . This has been incorporated into a newer resource from the SDSS team called Voyages , and there is a Voyages activity on galaxy shapes . Phil Plait's Crash Course Astronomy has "Galaxies, Part 1 " and "Galaxies, Part 2 ".